Frank Bach was a columnist for The Fith Estate, an MC for the Grande Ballroom and the lead singer and founder of the Mighty Up, the revolutionary house rock band for the White Panther Party. Frank and [and his wife] Peggy Bach were involved with the counterculture in Detroit and Ann Arbor beginning in the 1960s as musicians, performers, graphic designers, promoters, and activists for area jazz, blues, and pop acts. Frank Bach was also involved in community organizations supporting housing and economic development activities in Detroit. Frank Bach (Dedenbach) was born on November 28, 1948 in Detroit. He grew up on Detroit’s east side, graduating from University of Detroit High School in 1966. Frank continued his education at Wayne State University the following year. Peggy Jo Carolyn (Taube) Bach, born in Detroit on March 19, 1950, grew up in Madison Heights, a northern suburb of Detroit. Peggy graduated from Lamphere High School in 1968 and continued on to the University of Michigan. A love of rock and roll and the accompanying socio-political youth movement fueled Peggy Taube’s and Frank Bach’s involvement with the Ann Arbor and Detroit music scenes. Frank’s initial involvement came as a music columnist for the counterculture Detroit newspaper, The Fifth Estate,in 1966. He became the first stage manager of Detroit’s infamous Grande Ballroom in the fall of the same year. The Grande became a place for revolutionary music, showcasing innovative bands such as the MC5. Frank Bach dropped out of Wayne State University soon after starting at the Grande Ballroom in order to become more involved with cultural and political activities. It was during this time that Frank Bach met John Sinclair, a leader in the counterculture movement heavily involved in the music scene. The Bachs’ long-standing friendship with Sinclair led to many social, political, and business collaborations in the decades following their time at the Fifth Estateand the Grande Ballroom. Frank Bach was not only a music writer, promoter and producer, he was also an artist. He formed the band The UP in the spring of 1967. 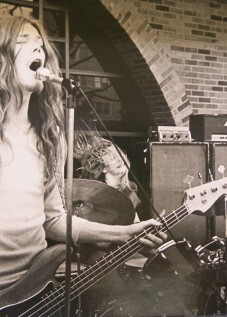 With Bob Rasmussen on guitar, Gary Rasmussen on bass guitar, Vic Peraino and later Scott Bailey on drums, Bach fronted the group as the lead singer. The “killer skinnies from the Murder City” played ferocious, fast rock later labeled as the forerunner of the late 1970s punk rock movement. John Sinclair described the UP as “out to change the world by the force of their musical assault and the purity of their intentions.” During their existence, the band’s music was compared to the MC5 although The UP never achieved the same level of notoriety. 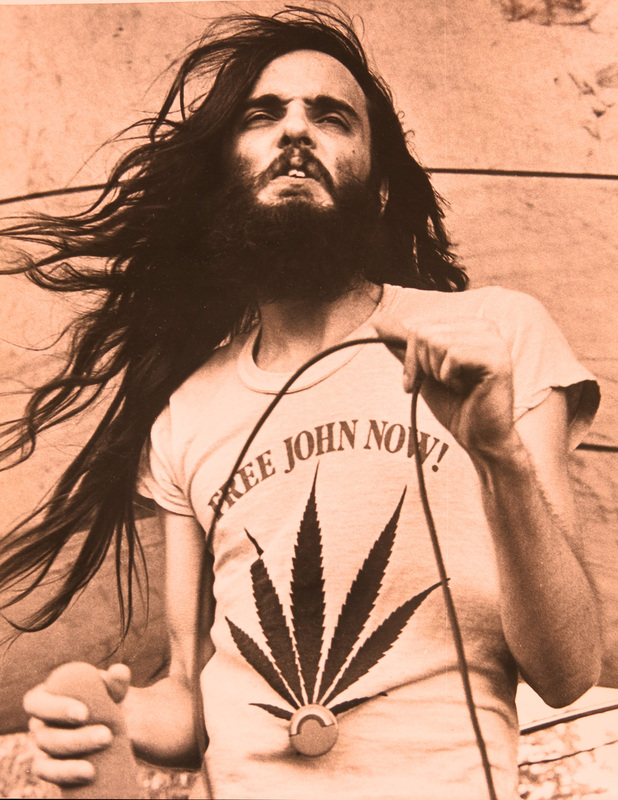 The UP released just two singles while together: “Just Like an Aborigine”/”Hassan I Sabbah” (1970, SunDance Records) and “Free John Now”/”Prayer for John Sinclair” by Allen Ginsberg (1971, Rainbow Records). David Sinclair, brother of John Sinclair, managed the group. The UP opened for the MC5 and headlined many concerts in the Detroit and Ann Arbor areas. The band changed its name to UPRISING in 1972 and continued without Bach on vocals, after Bach left to become the group’s publicist. Peggy Taube was also involved with the band, becoming their road manager during their later years. The band broke up in 1973. The UP/UPRISING never released a full length album during its existence. Alive/Total Energy records released an album worth of tracks in 1995 including their singles and other unreleased recordings of the band. Taube and Bach also established or were involved in several community organizations. Peggy Taube was one of the founders of the People’s Food Co-op of Ann Arbor. She became a general manager and purchaser for the organization before leaving the group in 1971. Frank Bach spent several years assisting the Ann Arbor Community Parks Program, producing concerts from 1968 to 1974. Bach was also involved with the Detroit People’s Ballroom Project, collaborating with Peter Andrews, Leni Sinclair, and Gary Grimshaw for its success. Bach and Taube became more focused on concert and production promotion as part of the various Rainbow People’s Party entities, descendants of the White Panther Party. Rainbow Multi-Media was founded in 1972 by John Sinclair and Peter Andrews to provide low-cost media assistance to local community organizations involved with positive social change. Frank Bach was the Director of Information, coordinating all publicity operations for the organization while Peggy Taube was in charge of the organization’s accounting. One of the larger events promoted by the Rainbow groups was the Ann Arbor Blues and Jazz Festivals, bringing in renowned artists for multi-day music concerts. The festivals received acclaim but were financial failures, ultimately causing the collapse of Rainbow Multi-Media in October 1974. Rainbow Productions, Inc. was established in its place and took up operations in Detroit during 1975. The company’s services included public relations, photography, graphic design, printing, recording, concert production, and management services. Peggy was the Production Manager and Comptroller for the organization while Frank was the Operations Manager. Frank Bach’s love of the music scene allowed him to become a frequent columnist for local counterculture and underground publications. Along with his column in the Fifth Estate, Frank was a writer and reviewer for Creem in 1968. Taube and Bach were also involved with the Ann Arbor and Detroit versions of the Sun newspapers. Frank often contributed articles and reviews for the Ann Arbor Sun. The couple was part of management in the paper’s later years, heading distribution and circulation. They also contributed to the Detroit version of The Sun. Frank was the Distribution and Circulation Manager in 1975 and the Arts Editor in 1976. Peggy was the Calendar Editor, an Editorial Assistant, and a Circulation Manager during the same time period. During the late 1970s, Frank also published several features on the local music scene including articles about local jazz musicians for the Detroit Free Press in 1977. Peggy Taube and Frank Bach teamed with John Sinclair and staff from Rainbow Productions and the Strata Corporation to form Stata Associates, Inc. in 1977. They offered publicity and marketing services and entertainment business consulting for local artists, non-profit organizations, and minority businesses. Bach and Taube played a leading role in the company. Peggy was in charge of financial management and bookkeeping, clerical and graphics production staff management, and advertisement scheduling and purchasing. Frank was the Executive Vice-President and Operations Manager of Stata Associates, Inc., involved with project design and administration of the company as a whole. Strata Associates represented a number of Detroit jazz and blues musicians and clubs. The couple was also involved with Allied Artists Association, Inc., a non-profit organization established to promote local musicians, provide professional support services, and to showcase their work to a wider audience. The Allied Artists consisted of a group of concerned music lovers including educators, musicians, archivists, and others involved with local music. Taube and Bach were involved with the organization directly and also through Strata Associates as consultants “to assist in the planning and implementation of its programs on a cooperative basis.” In 1978, Frank Bach became the Project Director of the Detroit Jazz Artists Presentation Project, later known as Composers Concepts concert series, established to present jazz musicians within classic concert venues. Taube and Bach were deeply involved with the establishment and daily operations of the Detroit Jazz Center, formed in 1979 through the combined effort of the Allied Artists Association, the Jazz Research Institute, the Jazz Development Workshop, and other community-based jazz organizations. The Jazz Center existed as a single entity to promote Detroit area jazz artists through on-site performances, the promotion and advertising of musicians, venues, and events, classes and workshops, radio broadcasts and recordings, arts, rehearsal, and office space, and the preservation of Detroit’s jazz legacy. Frank and Peggy managed the Creative Services branch of the Detroit Jazz Center, offering graphic design, publicity material production, advertising services, concert production, consultation, and grant writing services. Their deep love and commitment to local jazz artists kept the Jazz Center running even when financial difficulties meant they received little or no pay for their efforts. The couple remained a part of the Jazz Center until its economic hardships forced the center to close in 1981. After the collapse of the Detroit Jazz Center, John Sinclair and the newly-married Bachs founded a new music-centered management and promotion company, Morda, Sinclair, and Associates. MSA, later known as Music Services Associates, Inc. and Media Services Associates, included a client base of local pop and jazz musicians, venues, and production companies although it also included community groups and businesses. The company was divided into two groups. John Sinclair led the Talent Services portion, offering management and consulting services. Frank and Peggy Bach led Agency Services, the promotional section of MSA. It included such services as graphic design, printing, mailing, advertisement preparation and placement, and public relations for bands, clubs, businesses, and events. Legendary artist Gary Grimshaw worked for MSA’s Agency Services, creating original designs for clients’ publicity materials. Some of the company’s clients included The Urbations, The Flying Tigers, and The Sun Messengers. Frank and Peggy Bach went on to form their own graphic design and production company, Bach and Associates, in the 1990s. During the same time period, Frank became heavily involved with community organizations supporting Detroit development. He served as secretary of the Jefferson-Chalmers Citizens’ District Council (JCCDC) for a number of years, fighting for community input on development projects. He frequently clashed with other members of the organization, whom he saw as trying to subvert the democratic functioning of the Council and shut out community members. Frank also served on the board of the Creekside Community Development Corporation, using his experience in the music industry to lead the production of the annual Concerts By The River jazz series. The Bachs continue to reside in Detroit and to support local arts and development efforts through their personal and professional activities.